Greece declared a nationwide state of emergency Saturday as the country's worst forest fires in decades are being blamed for the deaths of at least 49 people in the past two days. 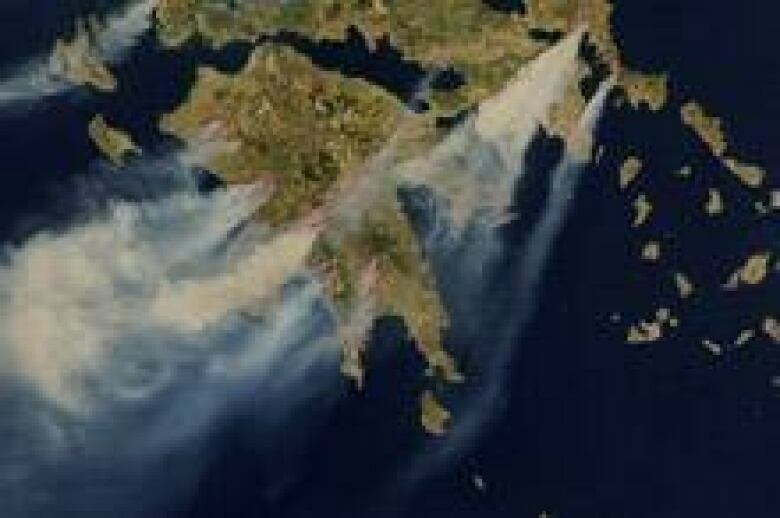 Greece declared a nationwide state of emergency Saturday asthe country'sworst forest fires in decadesare being blamed for the deaths of at least49 people in the past two days. More than 170 fires were raging across the country, fanned by strong winds and soaring temperatures thathave hampered rescue efforts. Greek Prime Minister Costas Karamanlis called the fires an "unspeakable tragedy" and said arson is suspected in many of them. "So many fires breaking out simultaneously in so many parts of the country cannot be a coincidence," Karamanlis said in a nationally televised address on Saturday. "The state will do everything it can to find those responsible and punish them." A 65-year-old manhas beenarrested and charged with arson and homicide in connection withone fire that killed six people in the southern Peloponnesian town of Areopolis. Separately, two youths were arrested on suspicion of arson in the northern Greek city of Kavala, officials said. Their parents were also to face charges. Hospitals across the country have been placed on alert asfears the national death toll will increase when rescuers reach isolated communities. Most of the deaths were reported in the western Peloponnesian region, near the town of Zaharo, where rescuers have been searching charred houses and vehicles. At least nine people burned to death in their cars on Friday as they attempted to flee the flames in the village of Artemida near Zaharo, according to local media reports. A car crashed into a fire truck, causing a traffic jam from that trapped people could not escape as the flames advanced, the Associated Press reported. Among the dead were believed to be a mother and her four children who were reported missing. Three firefighters whose truck was rammed were also killed, officials said. Mayor Pantazis Chronopoulos described the situation as "extremely dire" and said the massive fire ravaging the areaspread at an "astonishing" rate. Andonis Krespis, deputy mayor of Zaharo,330 kilometres southwest of Athens,said he and others abandoned their vehicles and ran through a field to escape the flames. There were reports of fires reaching the outskirts of Athens on Saturday. Authorities closed off a major highway on Mount Ymittos as flames approached the capital's eastern outskirts, damaging buildings in the Papagou suburb, the fire department said.